Structural steel is a popular material in the construction industry mainly thanks to its properties: steelwork is reasonably fast to erect on a building site, no need for formwork, high ductility, visual aesthetics. When it comes to designing and installing the steelwork, there are rules & laws to be followed, mainly for safety reasons. Most of the steel used in Europe is specified by the European standard EN 10025. However, there are many national standards that remain in force. Let’s start with some basics. The Eurocodes are a set of structural design standards, developed by CEN (European Committee for Standardisation) to cover the design of all types of structures in steel, concrete, timber, masonry, and aluminium. In the UK, they are published by BSI under the designations BS EN 1990 to BS EN 1999; each of these ten Eurocodes is published in several Parts and each Part is accompanied by a National Annex that implements the CEN document and adds certain UK-specific provisions. There are ten Eurocodes made up of 58 Parts that are being adopted in all EU Member States in 2010. 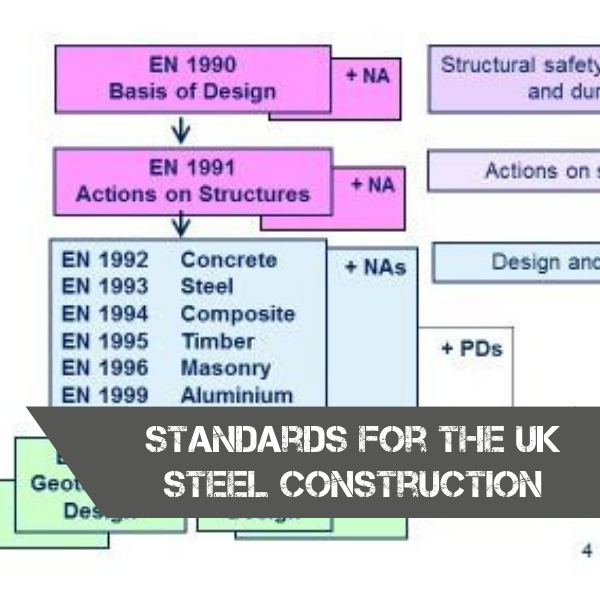 For us, the most important is EN 1993 Eurocode 3: Design of steel structures (EC3) that consists of 20 sections. The Government of the UK and its devolved regions publish documents which provide guidance on the means by which compliance with the Building Regulations in force in that region can be achieved. For structure safety for England – Approved Document A. There are also different documents for Scotland, Northern Ireland, and Wales but the differences between them are small. Approved Document A to the Building Regulations (England) currently references the Eurocodes. It is important to recognise that the regulatory system in the UK works in a way that the Building Regulations themselves merely make high-level demands, for example, that a structure is safe. Use of the standards cited in Approved Document A is only one way to demonstrate that requirement has been met. From the 31st March 2010 a suite of new British Standards for structural design, based on European Standards often called Structural Eurocodes, replaced conflicting national structural design standards which have, from that date, been withdrawn by the British Standards Institution (BSI). Under an agreement between the European standardisation bodies, national standards bodies, including the BSI for the UK, will withdraw any conflicting national structural design standards from April 2010. A withdrawn British Standard will still be available, however, it will no longer be supported by the BSI. This means that, within British Standards, current levels of safety in structural design will not be updated as knowledge increases, e.g. the effects climate change may have on wind and snow loading. The National Annex (NA) is an essential document when using a Eurocode Part. Where the opportunity is given in the text of the Eurocode, the National Annex will specify the value of a factor, to modify limiting values or a formula, specify which design method may be used, state whether an informative annex may be used – such annexes are explicitly identified as being open to national acceptance (or otherwise), and may concern things such as test methods. Although the NA may specify the value of partial factors to be applied to actions and resistances, in many cases it simply accepts the value recommended in the Eurocode text. The guidance given in a National Annex applies to structures that are to be constructed within that country. National Annexes are likely to differ between countries within Europe. The National Annexes for the country where the structure is to be constructed should always be consulted in the design of a structure. The good source for designers is the Blue book and the Green book. These helpful books are in accordance with Eurocodes and the UK National Annexes. The Blue book consists of design data such as dimensions and properties of each profile, description of strengths and how to calculate them, while the Green one is about the Simple Joints to Eurocode 3. You can find there all common types of connection such end plates, fin plates, splices, bracing connections also information about their welding to beams and columns. In my opinion, there is valuable information for example possible solution for different connection of different profiles, information about the types of bolts when to use them and how to install them and surprisingly contact to a supplier. Both of them you can see and download from https://www.steelconstruction.info/The_Steel_Construction_Information_System and the Blue book is available also in interactive version: https://www.steelforlifebluebook.co.uk. The design of civil and structural engineering works is based on recommendations of Codes of Practise. In Britain, these are published by British Standards Institutions BSI. But because of removing trade barriers in European Union, in March 2010 European Codes of Practise were introduced and published by CEN. But due to the different specification in every country, there were some parameters left as a choice for a National Annexes. These parameters are for example safety factors, design life period, snow, wind, isometric and seismic maps, safety-related parameters. In addition, the National Annex may contain references to non-contradictory complementary information. Member states of EU must accept designs to the Eurocodes. Eurocodes are the standard technical specification for all public works contracts. Whilst it is not mandatory to design to the Eurocodes in the UK, should a designer propose alternative design standards, they would have to demonstrate that the alternative is of ‘technical equivalence’ to a Eurocode solution. As the British Standards Institution (BSI) doesn’t maintain the withdrawn UK standards anymore, in reality, there is just a little option to don’t use the Eurocodes. For us is important and necessary to meet the technical specification to receive for all our products the required CE marking.